From relatively humble beginnings, the PokerStars European Poker Tour (EPT) has become the most popular poker tour in the world. Last year, 5,457 players from 118 countries around the world competed for a combined prize pool of €29,365,302. It's a far cry from the first ever European Poker Tour event in Barcelona, where 229 players, each ponied up €1,000 to play in the main event. Today, the average buy-in is eight times as much. Along the way the tour has given us some of the most exciting moments of TV poker ever; it's thrown up its share of heroes and villains and clowns; made countless millionaires and, of course, taken in some of Europe's most luxurious destinations. 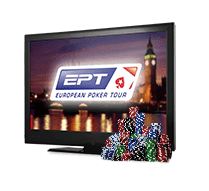 Can the EPT poker tour really be a decade old? Back in 2004 the poker boom was in full swing. The previous year, Chris Moneymaker had won the WSOP Main Event, after qualifying through PokerStars for a buy-in of $39. As an American everyman, he caught the public's imagination, and crucially he was the first World Series winner to qualify through a satellite, making us all believe that we could do it too. That would be the blueprint for the EPT poker tour - a high buy-in tour that could be fed through PokerStars involvement, via online satellites, giving amateurs the chance the to compete with the best players in the world, throwing up a mix of unlikely champions, as well seasoned, recognizable winners. It was the brainchild of Englishman John Duthie, a television director who had won the first ever Poker Million tournament on the Isle of Man, in 2000. The WPT had recently been launched in the United States and Duthie was impressed and wanted to create a European equivalent. "I established the EPT, designed the logo, went around to the casinos getting their agreement, broadcasting agreements, etc. I got [PokerStars] sponsorship money, and basically just spent seven months setting up the company," says Duthie. "[the first tournament] wasn't huge, but it was a beginning. And what was important was that the players were really embracing it." Duthie was able to unite his contacts in the TV and poker worlds which meant that the fledgling tour was televized that year: "I realized we had to televize to make it a big commercial success," he says, "and also for the players to be interested to play in it in order to get the exposure." The structure was always popular with the players too - a deep stack gave the players lots of play in the chips and rewarded skill. The list of winners for the first season reflected that, with the cream rising to the top: Alexander Stevic, John Shipley, Ram Vaswani, Noah Boeken, Brandon Schaefer, Pascal Perault and Rob Hollink are all still around today competing at the highest level of poker. EPT has always allowed quality to shine. Since the first season the tour has just grown and grown. By season four, the buy-in had risen to €8,000 and the prize pools swelled, as did the fields. The number of stops had also risen, from 7 to 12, and continued to do so, reaching its height of 13 different cities each year from seasons 6 to 8. Season 4 also saw the first visit to Paradise Island in the Bahamas, for the PCA, officially an EPT poker tour event despite the geographical non-sequitur. In all, 20 different locations have hosted European Poker Tour festivals over the years, from Monte Carlo to Warsaw; Loutraki to Kiev. Only Barcelona and London, however, have featured in the tour every single year since its inception. This biggest year of the EPT, in terms of numbers and prize pools, was the fifth season, with $60m of prize money being won across 11 events. Of the 7,768 people who played EPT events that year, 2,237 won their seats through PokerStars satellites. However, the biggest ever first prize in the history of EPT poker occurred in the fourth season, when Canadian Glen Chorny took home $3,196,354 at the EPT Grand Final Monte Carlo. It's had its fair share of high drama, too - and not just on the tables. In 2010 at the EPT Berlin, the tournament was robbed by masked men brandishing knives who got away with €242,000. No one was seriously injured but the incident caused mass panic in the crowd. The robbers were captured three days later sentenced to three years in prison. The advent of the High-Roller tournament in recent years has changed the dynamic of the festival a little - these huge buy-in events have short fields and massive prize pools and feature only the most successful tournament professionals in the world. High Rollers and Super-High Rollers have been dominated, largely by a group of German pros - players such as Tobias Reinkemeier, Philipp Gruissem, Igor Kurganov and Fabian Quoss. The main events themselves, however, remain as popular and as lucrative as ever, and it’s the Brits who are sitting pretty here, topping the leaderboard with 13 first-place main event finishes, closely followed by the United States with 12 and Germany with 10. "I knew it could be a success," says John Duthie, reflecting on how far the tour has come. "But I never really thought that it could have been as big a success as it has been, because it very much requires the complete support of the players. But PokerStars were crucial because they were constantly feeding in the critical mass of players to every single event by running satellites. They were constantly giving me support on the ground, and advising me on press and marketing, so they were very important. Ultimately the European Poker Tour grew so big because it was something the market needed at the time. The European market still needs the EPT, and although other copycats have tried to follow it, it will never be eclipsed by anybody else." In 2011 Duthie left the European Poker Tour to pursue other projects. The poker world owes him a tremendous debt. The EPT might not have the same glitz and glamour that the WSOP has, but it still offers some weighty prizes. We look at the biggest prize polls that the EPT has paid out and you can see that they all make the winners multi-millionaires. Now we don't know about you, but a few million dollars would certainly make us more than happy. If the €8,000 buy-in is too rich for your blood, don't worry - you may still get the chance to fulfill your dream of playing EPT poker. 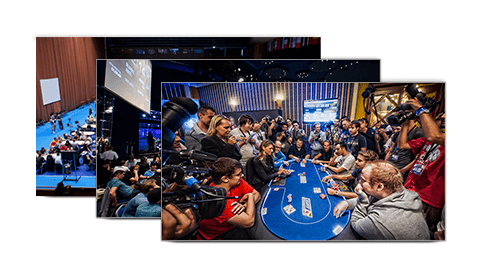 In fact, it's possible to make EPT poker a reality for just a few dollars. Since it's a PokerStars tour event, qualification is exclusive to the PokerStars site, but they offer satellites to suit every pocket. In fact, if you're willing to put the volume in online, you could even qualify with your frequent player points. EPT satellites run every day of the week. Many feeders can get you a place into the regular Texas hold'em poker EPT satellites for the price of a Big Mac, and you can find these tournaments in the PokerStars lobby in the months prior to EPT events. Regular satellites range from €22 to €530, with the number of seats available dependent on the size of the buy-in. Meanwhile, live satellites will spring up at the venue in the days preceding the main events. So what are you waiting for? Play a bit of online poker, EPT could be your next stop, and then maybe, just maybe, stardom might be just around the corner.